On the 28th April I took Hannu back to see this car for the second time. Having first seen it on eBay, where it failed to reach the owner's reserve price, I had already been over to see the car and enquire about making an offer. 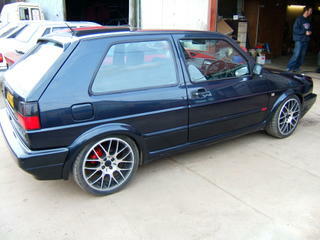 The offer was accepted, the old car was mine... a controversially accessorised 1990 Golf GTI 16 valve. Possibly a modern classic? If you are interested and have time to kill, try a read of this. Four months on and we have spent a lot of time together in my garage. I have learned a lot about old VWs, engines and how not to buy a second hand car, but am trusting that within a few days we should be back on the road together and anticipating a season of heady motoring pleasure. to record of the week.